The 2019 Budget is almost upon us and unfortunately it appears that yet again our various governments (State, Federal etc) seem to prefer spending large amounts of (our) money on old-world, outdated infrastructure rather than the infrastructure we know we will all need in the future. I note that another $115m is to be spent on the approach roads to Hobart which will join the $461m to build a new bridge across the Derwent River (at Bridgewater). That is almost $600m on roads and bridges just in Hobart! Now don’t get me wrong I like driving on roads and bridges, but having lived in Sydney for many years, Hobart’s traffic congestion still doesn’t come close to what’s going on over there (although I admit having a plan for the future would be prudent, but it should include the likely effects of technology). Just for comparison, the cost to upgrade all of Tasmania’s fixed line areas, those currently using NBN’s Fibre-To-The-Node technology, would be about $200m. So take your pick Tasmania: a few minutes less commute time or ultra-fast broadband which would mean that you could probably work from home and avoid the commute in the first place, oh and you’d still have $400m to spare – maybe bolster the Fixed Wireless network with delivering fibre to the towers, as originally envisioned, instead of the limited (but cheaper) microwave backhaul links they currently use. I get it that pollies, quite prudently, want to invest in technology they know will be useful and not soon get outdated. However I would argue that an investment in roads is riskier than fibre. Looking forward 40 years, are we sure we are going to need these roads, or at least such wide, multi-lane ones? By then there’s a strong likelihood that we will have self driving cars – ones that can drive at 110kph 1 metre behind the vehicle in front. They will be synchronised so that all the traffic moves in an amazing high speed dance through areas where we currently see congestion. We will need no traffic lights, cars will just call ahead to the other cars, then speed up and slow down as they approach intersections so they seamlessly join or cross the traffic flow. Will this happen? I don’t know, but it wouldn’t surprise me. It is certainly a cloud on the horizon for road investment. Compare that with fibre. There is just no possibility we won’t need this and lots of it over the next 40 years. Every part of our lives is increasingly connected and our demand for data carriage seems to grow completely unabated (anyone see any hint that it is going slow down?). Forget 5G, it will be a great technology, but it will only ever be a “fill-in” where mobility is important, it will never be able to do the heavy lifting that fibre, with its almost unlimited bandwidth capabilities, will provide. Hands up anyone who wants to predict that the internet is just fad and in 10 years time we won’t need it! Investing in fibre is seriously a dead cert. Tony Abbott said: “Do we really want to invest $50 billion of hard earned taxpayers money in what is essentially a video entertainment system?”. I wonder if this is the problem. A fundamental misunderstanding in what the internet really is. Let’s face facts, typically the most formative years of politicians, in previous business life, were before the internet really existed. For some, those who have been in politics from school, they’ve not been in areas where innovation has been needed . Perhaps, they just don’t get what the internet is about. For them the internet is just about entertainment. How do we change that? Yes the internet can be used for entertainment and why not? When I last checked governments everywhere invest in stadiums, parks and supporting the arts. Not to mention that roads also get used by people in their leisure time. This is about making our lives more enjoyable, we don’t want to just live to work. However the internet is so much more than entertainment. It is now a key driver to our economy – sadly it’s becoming a bigger key driver in other economies. You try taking almost any business and disconnecting their internet – it isn’t long before staff are sent home. Xero published a very interesting report showing how the arrival of NBN has caused businesses to do more sales and employ more staff – oh and these business no longer have to be in the centre of the city, at the end of a long commute, in order to operate or even do sales. So yes I get it that everyone is getting excited about 8k TV and many people are saying it won’t work here, but that’s not the only reason we should be rolling out fibre. Underpinning our mindset with technology ensures our ideas are innovations at a global standard. But if ideas are constantly held back by the limits of technology then we’ll always be playing catch up to other parts of the world who are turning their economies around. In fact, as the pace of other gig-cities picks up our opportunity to be a leader in the new world economy falls further behind. I get it that pollies love to turn up and cut a ribbon, great for roads, but there is no ribbon for a fibre project – it’s not all in one place – in fact that’s the point. Unlike a road that typically only connects two places (or crosses a river etc), what makes fibre great is that it’s a web of many points to many other points. Indeed, roads themselves are being reimagined. China is likely to build the first truly smart highway and auto makers are investing heavily to ensure their model lineups stay relevant! For anyone who clings to the idea that the current government are good economic managers, clearly has not understood the extraordinary damage they’ve done both to the financial viability of the NBN project and worse to our economy as a whole by switching to old copper technology. This damage is just beginning to show now, but there’s lots more to come as we continue losing our place in a connected global economy. What do we have to do to get governments to plan for the future before the damage is too hard to repair? Does anyone care that Australia could in the not too distant future lose our place as a first world economy. We’re all rather used to politicians (of both sides, but mainly the current government) spruiking their achievements in rolling the NBN. However the latest one from Senator Mitch Fifield, the Minister for Communications and the Arts titled ‘3 in 4 premises able to connect to the NBN’, is so full of inaccuracies and half truths that I feel it needs a response. The media release talks about how they’ve achieved 3 in 4 premises being able to connect to the NBN and that they’ve done this more cheaply and quicker than Labor’s original FTTP rollout. He then goes on to quote some figures about why the Coalition’s MTM model is so much better than the original Labor plan. “It’s our copper and you can’t have it unless you give us $20bn. We will then take that $20bn and roll out fibre to all the cities in competition with you”. The country would have been left with a very expensive, poor quality network. So the FTTP model wasn’t Labor’s initial option, but at the time the only viable one. They managed to negotiate with Telstra (paid them a bunch of money and waved a big stick in the form of spectrum allocation) for them to get out of the access (delivery to the home) market. This then laid the foundation for the Coalition 6 years later to return to the FTTN model. It is also worth pointing out that the previous Coalition government under Howard had created the problem with Telstra in the first place by, against a wealth of expert advice and experience in other countries, selling off the government’s controlling stake in Telstra without structurally separating it into retail and wholesale divisions. Indeed one of the early achievements of NBN was to force this structural separation. This may be technically accurate, but it is highly misleading. By measuring progress in terms of premises connected, they are completely ignoring the massive amount of planning and preparation that is required for a project of this size. IT systems, national network design, procuring construction contractors, designers etc – all that preparatory work needs to be done before the first premise is connected. This is not like building Snowy Hydro which is essentially a single project where each task is done once or just a few times. Rolling out NBN is like operating a distributed factory – it is the same task over and over again in different places. Lessons are learned, economies are found, production ramps up. The feedback I got from engineers at NBN that they had reached their 3rd iteration of the design and were just hitting their straps when it all came to a halt. Mike Quigley, the first CEO of NBN, fully expected the build to be completed for $54bn (about the same cost as the revised MTM cost) and to finish just one year later than the current MTM rollout – 2021. The cost savings and production ramp up, that Quigley expected to attain, have easily been achieved by Chorus in NZ, yet NBN and the government stick doggedly to their $4400/premise price for FTTP to justify their use of the MTM. A recent article posted on The Monthly shares a very detailed reflection of Quigley’s views on how the Coalition broke the internet. When the Coalition came to power the first thing Malcolm Turnbull (as Communications Minister) did was to launch an enquiry into the current FTTP rollout. They took the current rollout progress and simply extrapolated it to get their 8 years longer and $30bn more – clearly the enquiry was totally self serving and designed to justify their change to MTM. The old joke of a politician never announcing an enquiry unless they know the outcome seems very apt. However the worst part of the whole thing is that Australia has spent all this money (same as the FTTP rollout) and we have been left with a dud – it may not be a complete dud now, but it will be in five years time. We got the expensive, poor quality broadband that the Labor government had originally considered and rejected. NBNCo is struggling to meet it’s revenue targets as people connect to the NBN at a lack lustre rate. When rolling out infrastructure, which is slow and expensive, you don’t look at what the market needs now, but at what it will need in 10 or 20 years time. Anyone can see that our need for fast, reliable broadband is only increasing (40% per year according to the ABS). In the long term what the Coalition have done is set our economic future back at least 10 years. It will end up costing the country significantly more overall when we have to do the inevitable upgrade to full fibre (and no 5G isn’t going to cut it). This from the party that calls itself “the better economic managers”. We will look back on this period as the greatest wasted opportunity. It’s an extraordinary shame that we failed to grasp it. If you want to hear Mike Quigley talk about this much more eloquently than me, I highly recommend you watch his opening statement (the first 12 minutes) of his recent testimony to the Senate Committee. It is not clear what the long term fix for the NBN is, but the first stage has to be to recognise that we have a problem. The sooner we can get the politics out and the engineers in, the sooner we can make a start. The company building Australia’s National Broadband Network, NBNCo, have said on many occasions, that they are confident of reaching their $52 ARPU (Average Revenue Per User) target at the end of the rollout in 2020. This is important because it underpins the value of the company as a whole and therefore any discussions of whether there should be a writedown in the debt that it owes to the Commonwealth. They have made much of their various business offerings including Enterprise Ethernet and the business bundles as how they will raise this extra revenue. However they have really only hinted at where they actually expect most of this extra revenue to come from: CVC Overage. A quick recap: CVC is the bandwidth charge that NBNCo levies on RSPs for the amount of bandwidth that they deliver to NBN for delivery to their customers. It was the cause of much argument in the latter half of 2017 as RSPs were clearly restricting their CVC purchases (in order to keep their retail prices down), allowing their customers to get very congested connections. Most people blamed NBNCo’s choice of FTTN, HFC etc as being the root cause of the poor performance, rather than the RSPs buying decisions around CVC. NBNCo temporarily solved the problem by offering first “Focus on 50”, then the bundled plans that included enough CVC (at the time) for a reasonable discount to the RSPs. Over the course of 2018 many RSPs took up Focus on 50 and then the bundles and the ACCC reported that congestion seemed to be a thing of the past. But is it? The sting in the tail with taking on the bundles is that an RSP has to commit to not congesting their CVC – in other words NBN does not want them to sell a congested product over the NBN. They do this by explicitly stating that they must not exceed 95% utilisation for more than 7 hours in any 7 day period – there’s more in there, but that’s the gist of it. The amount of CVC included in the bundles is 2Mbps for an nbn50 connection and 2.5Mbps for an nbn100 and above. However Australia’s bandwidth is currently increasing at about 40% per year and doesn’t look like slowing down anytime soon, indeed with the growth of high definition TVs it is only set to accelerate. So if 2Mbps was enough a year ago, it would need to be 2.8Mbps now just to keep pace with this growth. So if you’re an RSP selling unlimited data plans what do you do? You can’t constrain your users (or even get more money from them by upgrading to higher data download plans) yet you also can’t let your CVC become congested. You just have to buy more CVC – more than the included bundled amount – to avoid congestion. This extra amount is called “CVC overage” and NBN currently sell this for $8/Mbps/month. So some quick maths, if you are selling an nbn50 with its 2Mbps of included CVC, but actually have to allocate 3Mbps to avoid congestion, now instead of that connection costing you $45 per month, you are now looking at $53 per month. 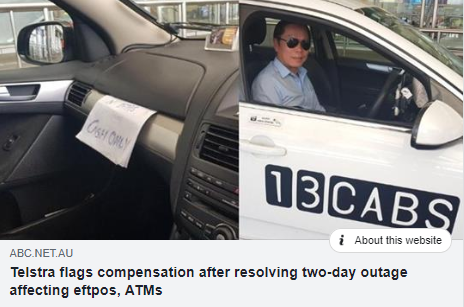 NBNCo’s revenue problem solved! So will the RSPs actually stump up the extra money? If history is anything to go by, it is not looking good. Most RSPs are already complaining that they are making no money from NBN products so they have little incentive to play ball. The good ones probably will go ahead and they will either have to stop selling unlimited plans or put their prices up. The others will simply restrict the bandwidth before it reaches NBN to keep it below the 95% threshold that NBN have set, in order to stay within the rules. So we will be back to 2017 with its congested networks all over again. At which time we can expect the finger pointing to restart. NBNCo is clearly banking on RSPs buying this overage, only time will tell if they actually do. For the record at Launtel we are already finding that the allocated CVC bandwidth with the bundles is not enough for a congestion free service and have started buying CVC overage. We believe that a high quality, low congestion, network is our primary goal, even if it means we have to charge more than the others. So it looks like there was a big stuff up with Telstra and ANZ EFTPOS terminals in recent days. Now while this has nothing to do with our network, and wouldn’t have affected any of our users using wi-fi terminals, we thought it’s a good opportunity to remind everyone of the importance of backups. Rather than focus on the problem, let’s focus on the options so businesses don’t get stuck again. No technology will ever be 100% reliable and as business owners, we have to perform risk management and identify single points of failure. I would argue that it’s only because this service is so reliable that we saw this issue. If it was failing regularly people would already have an alternate system. If your business depends on EFTPOS for a substantial portion of your sales (and many do these days) just remember there are many reasons your EFTPOS could go down – not just network outages. It’s important that businesses think of risks and whether or not they’re prepared to take the risk that if something fails they have no alternative option for continued operation. So what type of considerations would we recommend? 1. Some bank terminals such as Albert from Commbank work on both mobile and wi-fi. So that gives some extra buffer, but again the bank might have an outage which neither internet connection will save you from. 2. You could get a second Eftpos service from a different bank as a backup – for around $30/month. Again, how important is it to you – how much could you lose if it goes out? 3. You could sign up to an online merchant that has a low fee and you can do transactions on your mobile. This way if your bank goes out you can still take the payments. Square is a low cost alternative and you can either enter details manually, or you save a bit per transaction if you use the chip reader that you can buy for $29 or contactless for $59. More details about Square here. 4. You can just take the risk that it won’t happen often. Then once you think about that, remember, having backup also extends to a range of technologies not so obvious, as the South Australia Correctional services have just found out when many offenders went unmonitored for 24 hours. We’re also unsure but suspect it may also extend to monitored alarm systems as many now rely on the mobile network rather than land line. When the NBN was first floated one of the primary goals was to “level the playing field”. Telecommunications usually favours the large player due to the amount of capital required for infrastructure. For 20 years Telstra called pretty much all the shots in the Australian telco industry and played a game of cat and mouse with it’s arch-nemesis the ACCC. Telstra was famous for favouring its own retail division over any of its wholesale customers for example. While NBN (along with the structural separation of Telstra) has done much to level the playing field, there have been a number of smaller, apparently less significant, decisions that seem to be going in the opposite direction. Phil Britt of Aussie Broadband has publically criticised a proposed extension of the time before NBN will force telcos to switch off their old “special services”. Firstly I would like to point out I fully support Phil’s position, but I would like to add some meat onto the bones. Yet again we see the big telcos manipulating NBN to their own ends at the expense of Australia. So why should you care? If your NBN is delivered over FTTN (Fibre-to-the-node) technology, which is the case for the vast majority of Australians, then a delay here will mean that you will have slower, less reliable internet for longer. One of the downsides of FTTN is that it uses the same copper that is also used for phone lines, ADSL and also these “special services” – predominantly a phone technology called ISDN used by many businesses. Unfortunately when you run two copper cables next to each other, there is a tendency for the signal to jump from one cable to another – this is called “crosstalk”. The higher the frequency of the signal, the more that this is a problem and FTTN uses very high frequency signals. This crosstalk causes interference. During the migration period when people are both using the old technology and the new FTTN technology (called in NBN parlance “co-existence”), to reduce this interference NBN have reduced both the frequency range and the signal power of the FTTN nodes. Because of this people have reduced speed and a less reliable internet connection. Under the original FTTP rollout, there was an 18 month migration period when all the regular services (phone and ADSL) were forcibly migrated across to the NBN. There was actually no technical reason for this (copper and fibre run just fine side-by-side), it was purely a political and economic one. At the time the remaining copper based “special services” were the can that was kicked down the road to be dealt with later. However under the FTTN technology a decision to delay has real consequences. Under FTTN the same 18 month migration period exists for phone and ADSL. We were all looking forward to the co-existence period ending after 18 months and people’s connections being turned up to full power, however because of these special services NBN still hasn’t turn off the “co-existence” mode at the node and is now talking about delaying it again. So why would the big telcos be requesting a delay on this? As usual it is all about money. Firstly a telco typically earns more money on the old legacy services than the newer NBN ones. Secondly a telco has to engage with their customer and help manage the process for migration, this of course costs money. Thirdly whenever there is a network change, it typically is a time when a customer will re-evaluate its choice of supplier. Indeed the biggest barrier to competition in the telco space is sheer customer inertia – if a service is basically working most customers are, quite reasonably, nervous to make any changes. This is unfortunately due to their experiences with the major telcos who regularly stuff things up during migrations. The large telcos would very much like their customers just to do nothing and keep buying from them. However they are doing this at the expense of the quality of the internet for the rest of us. They have had plenty of time (years) to plan and execute this, if they are still not ready, then clearly they don’t want to be ready and are using this as yet another way of keeping the more nimble challenger telcos off their turf. It is with a some sadness, but no great surprise, that we heard that Telecube is to stop offering NBN plans. I feel this is unfortunately the first part of the issues of the NBN retail industry that I wrote about just two weeks ago. My understanding is that the company has gone straight to liquidation which means that there is no prospect of any of the business being worth saving. Their upstream wholesaler has been acting quickly to disconnect the services that were being provided by Telecube. For Telecube clients in Tasmania and Canberra who are left without an internet connection we are happy to provide you with a 7 day free trial of our service. I am hopefull you will not be headed back to the big telcos! I note that some of the other providers are providing discounts to people to come across to them. Unfortunately this is the typical knee-jerk answer to “how can we get customers?”, which created Telecube’s problems in the first place. Our industry has to get out the habit of discounting to get customers, we need to build value in other ways – like customer service!